252 spares began its business in 1986 in the small Dumfries and Galloway village of Dunscore. The business concept was to concentrate on providing specialist information and spare parts only for the Land Rover range of vehicles. Back then the phone number of the business was Dunscore 252 hence the name choice. In order to expand its range of spare parts to its growing customer numbers 252 Spares moved into Dumfries in 1987 and into its current Whitesands premesis in 2005. 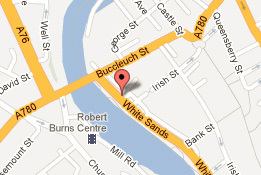 The current shop is in a prominently situated building overlooking the River Nith. The building was first constructed in the late 1700s and has undergone many refurbishments since. The most recent renovations include a new customer reception area , extended spare parts storage and extensive flood defence system. 252 Spares has gradually expanded over the years along with the range of Land Rover vehicles made available. Parts and accessories are in stock for all models from the oldest models to the most recent. This includes ; Series 1 , 2 and 3 , Defender 90 / 110 , Discovery 1 ,2 ,3 ,and 4 , all Range Rover models and Freelander 1 and 2. There are over 5000 parts currently held in stock in all categories. This includes simple nuts , bolts and fastners to Gear boxes , exhausts and body panels. Accessories and vehicle enhancements are also available. Almost all other parts can be sourced from reliable suppliers and manufactures and can be ordered for next day delivery. David Greenwood the business owner has over 25 years of experience in restoration, breaking and maintaining various models of Land Rover. He uses the knowledge now for advice and problem solving when customers are seeking parts.